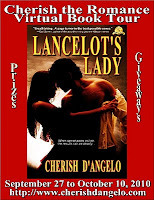 On Day 3 of my 15 day, 115+ blogs tour, you'll learn more about Cherish D'Angelo and find out how Lancelot's Lady came into being. Enter to win more great prizes, and if you comment on ANY blog stop post with your email address, you're guaranteed to receive a free ebook. Buy Lancelot's Lady At KoboBooks, Amazon Or Smashwords. So excited to be a stop on your massive Virtual Book Tour! Have fun with it and hope to learn more about your new book! Thanks for dropping by DeNita and Jaime. I am having a blast.